On Saturday 20 July, we planted some fruit trees to supplement those already planted under the Trees for Babies scheme in 2011. Huw from Auckland Council, arranged for the trees and stakes to be delivered; 7 x feijoa, 1 banana and 3 x avocado trees. 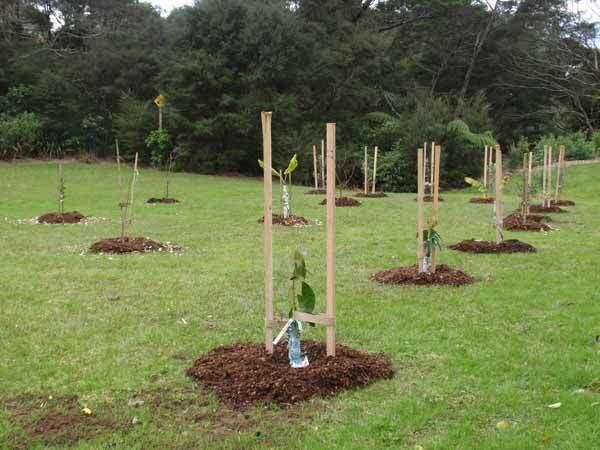 The original planting design showed the feijoa trees planted close together in a mulched area so that they could form a hedge to protect more vulnerable trees such as the banana and avocado trees. We followed the plan, adding the feijoas in a line next to the one that was originally planted. We had 6 volunteers; Hui yong, Selina, Chris, Nicole, Mike and Jacqui, which made the job of planting the 11 trees faster than expected. Half a bucket of horse manure/sawdust was added into each hole prior to planting the tree. The stakes proved a bit of a challenge due to the length, so our volunteers improvised by standing on buckets, in order to get enough height to be able to hammer in the stakes. A few months ago, we had a mulching day for the fruit trees but unfortunately the cardboard that we used underneath the mulch had been dispersed making a bit of a mess. So, we picked up the excess cardboard and added fresh mulch to those trees as well. It was great to have such a successful day. The next task is to put continuous mulch around all of the feijoas so that mowing between them is unnecessary. We recently obtained a number of coffee sacks through Tony Phillips, one of the West Auckland Community Garden Network members. Tony and fellow volunteers at Lucinda Place Community Orchard, use the coffee sacks around their fruit trees, filling them with mulch. We plan to follow their example with the feijoas.